Photograph on the rugged mountains, in the vibrant rainforests and along the pristine coastline of Washington state’s Olympic Peninsula, in one of the most beautiful and diverse national parks in the U.S. This is a 5-night and 6-day workshop. Your adventure begins at 10 a.m. on September 24 and ends after a final slideshow on the afternoon of September 29. Note: Deposit of $400 is required to reserve your spot at the workshop. Balance of $1,400 due on July 26, 2017. Or, you may choose the "Pay in full" ticket if you desire to pay all at once. Olympic National Park is contained wholly on the Olympic Peninsula, a beautiful arm of land a few hours west of Seattle and Puget Sound, bordered to the north by the Strait of Juan del Fuca and to the west by the vast stretches of the open Pacific Ocean. Within park boundaries are three distinct ecosystems, all pristine, all beautiful, and all rife with opportunities for amazing night photography. In the mountains we’ll explore views of the Olympic peaks, surrounded by alpine meadows and towering evergreens—an ideal place for wide-angle lenses and stunning astrolandscape photography. 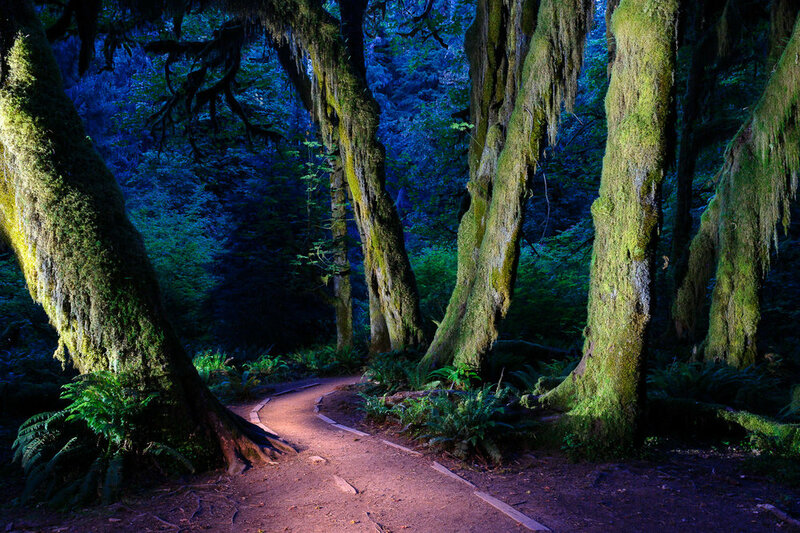 In the rainforest we’ll discover scenes reminiscent of fantasy novels and fairy tales—a place that will inspire and challenge your light-painting prowess. On the coast we’ll work around tide pools and sea stacks and the scattered enormous trunks of ancient driftwood—one of the most perfect places on earth for photographing the stars over distant ocean horizons. This early autumn workshop will entail five nights and six days of photographing some of the most beautiful scenery in the Northwest, plus classroom time to learn night photography skills to use in the field. 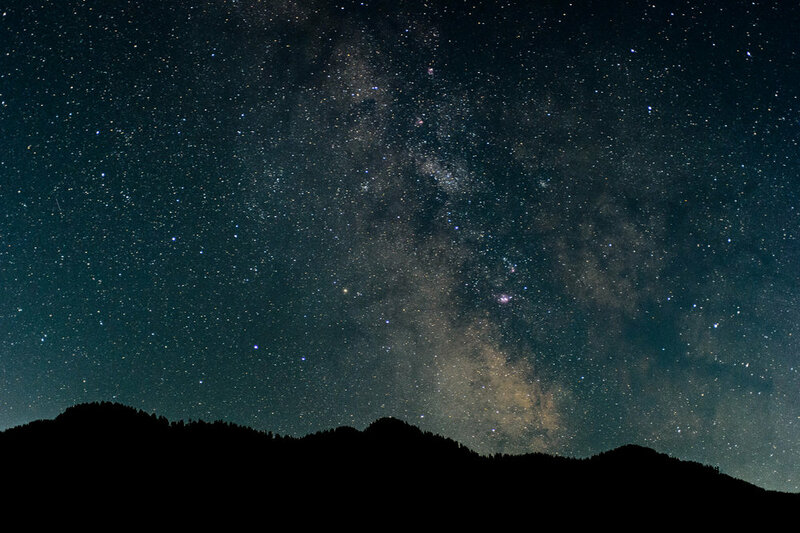 The gorgeous night skies of Olympic will be perfect for photographing star points and star trails over iconic locations such as Hurricane Ridge, Second Beach, Ruby Beach, Lake Crescent and more; and the surreal Hoh Rainforest, like a scene out of Tolkien, will serve as an otherworldly canvas for our light-painting flashlights. Though Olympic is most highly visited in summer, many locals consider September to be the best month to spend in the park. The air is clean and crisp, colorful mushrooms bloom, and elk in rut can be heard bugling among the spruce and hemlock in the rainforests and valleys. The weather in Olympic is so varied that if you ask a ranger what today will be like, they’ll just say, “Where?” Come prepared for a wide range of conditions: warmth during the day, and chilly conditions in the mountains and on the coast in evening. Also, we will shoot in the rainforest, which will likely be wet. Bring rain gear—especially consider packing rain pants and water-tight shoes. The workshop will include two nights based out of Port Angeles, a harbor town on the north edge of the peninsula, and three nights based out of Forks, famed for being home to the thriving populations of vampires and werewolves in the Twilight novels. The two places are different, one an active international port with varying food options and a great local winery, the other an unassuming town with homey mom-and-pop diners and taverns. Additionally, the park has plenty of camping opportunities, and the towns have other lodging options that we are happy to help with in any way possible. However, we do recommend using the group hotels, as it more easily facilitates meeting with the other participants each day. Chris' tip: I fly to SeaTac and like to take the ferry across Puget Sound, then drive to Port Angeles from the dock. It's a beautiful trip, and you might even see orcas! There will not be any long hikes, but you should be comfortable carrying your own equipment over uneven ground in the dark. One forest-to-coast hike will be 20 minutes, and there may be optional, partial-group hikes slightly longer. No rigorous activity will be required, but please consider your physical abilities prior to registering. As with most NPAN workshops, we will generally be operating on a two-meal schedule—late breakfast and then an early supper before going out to shoot. Many people bring sandwiches or other snacks to eat on location at night. Also, please be advised that because of the distance between some of the park's best environments for photography, we will stay at two different hotels, so there will be a morning when we need to drive a couple of hours between towns. I knew for years that I wanted to go to Olympic National Park. I didn’t know why—there was just something in my soul that yearned to be there. So when I had an opportunity to spend three weeks in Seattle in 2011, I immediately said yes, knowing I would finally be able to visit this national park that had captured my imagination from afar. My first experience there was with the mountains—the beautiful vistas of Hurricane Ridge, Hurricane Hill and Deer Park. Then I explored the Sol Duc and Hoh rainforests, weaving among the wet and wild scenes of green growing upon green growing upon green. But it’s my memory of the coast that has especially lingered since that first trip. I remember visiting Rialto Beach, and my first view of the Pacific from within park boundaries. I parked my car, walked a short distance down a forest-edge trail, and then clamored over the line of massive driftwood logs that separate the Olympic land from the Olympic sea. The view was stunning. Waves coming from great distances beyond, rolling up onto the stone-strewn shore. Sea stacks standing sentry hundreds of yards out among the receding tide. And a thin fog marching toward land, enveloping the seascape with a mythical aura. I had intended to visit Rialto for just an hour or so, but instead spent the rest of the day. I hiked north past Ellen Creek, toward Split Rock and Hole-in-the-Wall, and ventured past the promontory. I spied and photographed stones, sea stars and sand dollars revealed by the ebbing seawater. I watched the sun set behind mammoth sea stacks while tall, magnificent clouds shifted across the sky, rim-lit by the distant waning light. In twilight I made the return hike, slowly meandering the shore, enjoying the quiet hush of surf washing the edge of the land.